Last week I set out my main concerns in relation to poor procurement processes with the THA/BOLT project. A large amount of Public Money was being committed to a project with little apparent regard to Value for Money concerns in an arrangement which seems to expose the THA to the principal risks at a time of limited financial resources. This article is a critical examination of the controversial proposed purchase of 50.6 acres of land at Calcutta Settlement by the Housing Development Corporation (HDC). With over 125,000 applicants on the HDC’s waiting-list, there is no doubt that, for many poor people, the HDC is their only hope of getting a reasonably affordable home of decent quality. That means that the HDC is an important implementing agency in our nation’s welfare provisions, which is a role I fully support. This post is about ‘Eden Gardens’, which is on the western side of Calcutta Settlement Road No. 2 in Freeport, just north of Central Park, opposite to Madoo Trace. The property comprises 264 residential lots at an average size of 5,600 square feet, 2 residential/commercial lots, 2 nursery school sites, 2 recreation grounds and 4 playgrounds. In November 2011, the HDC obtained a valuation from Linden Scott & Associates at $52M. In January 2012, the owners of Eden Gardens, Point Lisas Park Limited, offered the property to the HDC at $200M. That is an intriguing sequence of events, since the HDC would hardly pay for a valuation on a property they were not interested in. If we accept that the property was likely offered to the HDC before they ordered the Scott valuation, then one has to ask on what terms was it offered. That letter of offer, the original one, must be disclosed now. In April 2012 the Commissioner of Valuations advised the HDC that the current open market value of the property was $180M. In June 2012 Cabinet approved the HDC purchase of that property for $175M, which is $663,000 per lot – at an average lot size of 5,600sf that equates to $118 per sf. The normal professional and commercial practice when buying in this quantity, is to obtain a discount on the unit price. It would be reasonable to expect that these lots could be sold for significantly more than the HDC agreed to pay. We will see. There was a lot of argument in the public about this transaction, so I was prompted to look closely at the deal. On 1 June 2004, Anthony Sampath, Patrick Soo Ting and Azad Niamat agreed with the owner, Sookdeo Deousaran, to buy the property for $17M. That Sale Agreement is registered as deed # DE2006 023638 20D001. On 26 April 2007, PLP was incorporated as Co. # P2956 (95), with the same three individuals who agreed to buy the property for $17M as its Directors. On 6 May 2011, the Companies Register recorded that Kayam Mohammed became a Director. On 3 February 2010, according to deed # DE2010 007816 95D001, PLP purchased the property from Sookdeo Deousaran for $5M, paying Stamp Duty of $350,000. These purchasers were prepared to pay $17M for this undeveloped property in mid-2004, but ended up paying only $5M for it in early 2010. This is the same property which was offered to the HDC at $200M in early 2012, two years later. Literally unbelievable. The stated payment of $5M shown in that 2010 deed is a massive understatement of value, probably being only 10% of the true market value. The Stamp Duty properly payable on a $50M sale of land would have been $3.5M. The Stamp Duty Section of the Board of Inland Revenue has the discretion to refer transactions to the Commissioner of Valuations in cases where they suspect that the consideration shown on the deeds is understated. I am reliably informed that in this case the BIR did not seek an opinion from the Commissioner of Valuations. I am calling for that 2010 transaction to be revisited immediately, with a view to the State recouping the proper Stamp Duty. The Public Interest demands no less. Between 2004 and 2012, the infrastructure for Eden Gardens was built, which included the roads, street lights, drains, water and electricity supply. 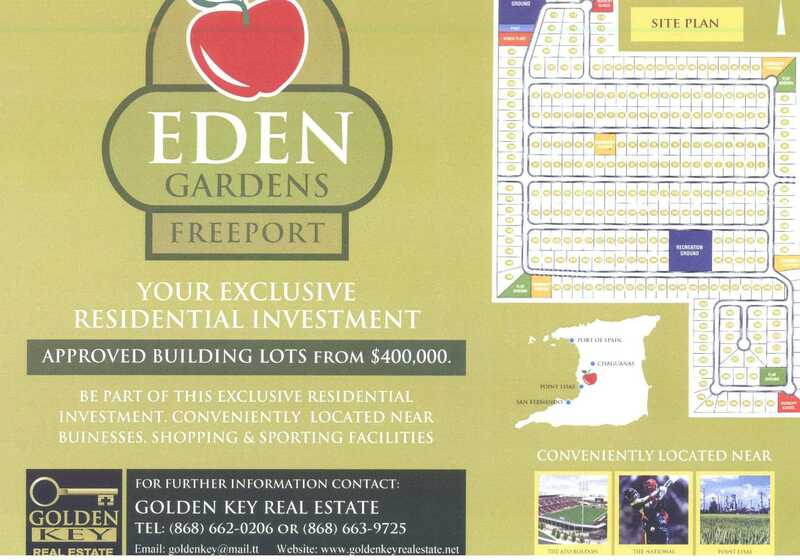 Eden Gardens lots were available in 2011 via at least two real estate agents – Golden Key Real Estate Ltd. and Samko Realty – at $400,000 per lot. This was widely advertised. Those lots were known to have been on sale at $400,000 in 2011, so the entire development of 264 lots could have earned its owners a total of say $106M. Even if we allow a figure of $5M for the “2 residential/commercial lots and the 2 nursery school sites”, we are still in the range of $110M as the ‘Gross Development Value’. Given that these lots were clearly not selling at the $400,000 price-point, those estimates are at the upper end of possibility. Which means that we have to adopt a lower ‘Gross Development Value’, say $95M-100M. Time Value of Money, to account for the element of delay in recouping one’s investment. I estimate that those discounts would amount to 35-40% of the Gross Development Value. If we adopt that approach, the maximum net present value of Eden Gardens in early 2012 as a fully-infrastructured property would be in the $60M range. The usual accepted practice of residential development can be expressed by this ‘rule-of-thumb’, to spend less than twice the cost of the lot does not make best use of that land. It is most disturbing that there has been this amount of debate without the issue of the end-user ever being mentioned. How do the real needs of the homeless feature in this massive HDC transaction, if at all? To my mind this Calcutta Settlement scheme resembles the HDC’s flagship project at Fidelis Heights in St. Augustine which created an elaborate, expensive multiple-family project with no allocation of new homes to the needy people on the waiting-list. I have established via a separate enquiry that only about 2% of the HDC output of new homes is allocated to those who can only afford to rent and this project is likely to be a continuation of that detrimental trend. The HDC continues to allocate vast sums of money to housing those who can afford to buy, while leaving the left-overs for those who can only afford to rent. That policy is inimical to the interest of the poorest members of the public, to whom the HDC is literally the last refuge for decent housing. What is being done about the under-stated consideration in the 2010 deed for the sale of Eden Gardens? How many of the 264 lots were sold at the 2011 asking-price of $400,000? That is important since it establishes a benchmark for the proper value of these lots in the open market. When did Eden Gardens receive all the required approvals? When was the infrastructure completed at Eden Gardens? On what terms was Eden Gardens originally offered to the HDC? There is an abundance of develop-able State-owned lands in the vicinity, particularly since the 2004 closure of Caroni Ltd. So why did Cabinet agree to buy private lands in Calcutta Settlement at these prices? Who owns Point Lisas Park Limited? Raymond & Pierre Limited, under my leadership, provided certain professional advice on this property in 2007. No aspect of that advice has formed part of this article. Linden Scott is a former colleague of mine, having trained at Raymond & Pierre Limited. He is now a rival professional. Raymond & Pierre Limited have provided professional advice to the HDC in the past. TED featured Afra Raymonds TEDxPortofSpain talk as a talk of the week. Afra joins the top 1% TEDxTalks featured on the TED.com website. What has me thinking is the cooperation of all parties concerned in this transaction. First of all according to the first sale agreement. The purchaser had to pay the full amount in 2 years time or else they forfeited the down payment. Six years passed before the property was sold for the lower figure of 5 million. In effect with collusion of all parties the purchaser avoided over $800,000.00 in stamp duty to the government. Then the sale to HDC really of 175 million is really eye opening. The purchaser must have some contact in government to bring this transaction to fruition. These are my observations. Keep up the good work.